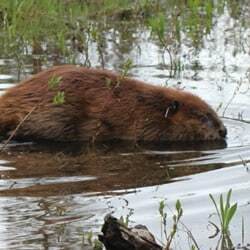 The beaver (Castor Canadensis) is North America’s largest rodent. Adult beavers typically weigh 45 to 60 pounds, but have been known to grow to 100 pounds. Native Americans greatly respected beavers, calling them “Little People”. Beavers and humans are alike in their ability to greatly alter their habitats to suit their own needs. To obtain food and building materials, beavers are well known for their ability to topple large trees using nothing but their specially adapted incisor teeth and powerful lower jaw muscles. Beaver teeth never stop growing, so they do not become too worn despite years of chewing hardwoods. Their four front teeth (incisors) are self-sharpening due to hard orange enamel on the front of the tooth and a softer dentin on the back. Therefore as beavers chew wood the softer backside of the tooth wears faster, creating a chisel-like cutting surface. The beaver’s most distinctive feature is their large flat tail, which serves as a rudder when swimming, a prop when sitting or standing upright, and a storehouse of fat for the winter. Beavers will also slap their tail on the surface of the water as a danger warning to other beavers or sometimes in play. They do not use it to carry mud. Beavers are aquatic mammals with large webbed hind feet ideal for swimming, and hand-like front paws that allow them to manipulate objects with great dexterity. They have excellent senses of hearing and smell, and rely on these senses more than their less developed sense of eyesight. When swimming underwater a protective transparent membrane will cover their eyes, and flaps close to keep water out of their nostrils and ears. In addition, behind their incisors they have inner lips that allow them to carry sticks in their mouths while swimming without getting a mouthful of water. Beaver fur consists of short fine hairs for warmth and longer hairs for waterproofing. They need to groom their fur daily to keep it waterproof, and frequently groom each other’s fur. They have castor glands on the under side of their abdomen from which they can excrete an oily substance (castor) that they use in the grooming process, and to mark their territory. Beavers are pure vegetarians, subsisting solely on woody and aquatic vegetation. They will eat fresh leaves, twigs, stems, and bark. Beavers will chew on any species of tree, but preferred species include alder, aspen, birch, cottonwood, maple, poplar and willow. Aquatic foodstuffs include cattails, water lilies, sedges and rushes. Cattail and water lily tubers are favorites. Using their nimble front paws, beavers will roll lily pads like cigars to eat them. Beavers do not eat fish or other animals. In cold climates each Fall beavers will stockpile (cache) sticks underwater because they do not hibernate. They live on these sticks because once their pond freezes they will no longer have access to trees on the land. Beavers remain inside their lodge all winter except when they swim under the ice to their food cache for a stick to nibble on. Beavers build and maintain houses called lodges. There are two main types, the conical lodge and the bank lodge. The most recognized type is the conical shaped dwelling surrounded by water. It is made from sticks, mud and rocks. One of the primary reasons beavers build dams is to surround their lodge with water for protection from predators. The second type of lodge is the bank lodge. It is typically excavated into the bank of a large stream, river, or lake where the water is too deep or fast moving to build the classic conical lodge. Within each lodge beavers will hollow out a chamber where they sleep, eat, groom each other, and the baby kits are born and nursed each spring. Beddings of grasses, reeds and wood chips are changed regularly. In order to breathe fresh air beavers do not apply mud to the peak of the lodge, creating a ventilation shaft. Note: If you have an opportunity to visit a beaver lodge on a very cold winter day, look very closely and you may see the beaver’s breath escaping from this chimney-like peak, or even hear the murmurs of the beaver family inside! Each lodge contains at least two water-filled tunnels leading from the chamber to the pond so the beavers can enter and exit the lodge underwater without being spotted by predators. The walls of the conical lodge are very strong due to layers of mud and sticks, and are extremely insulated. Even with subzero outside temperatures it will not drop below freezing inside the lodge due to retained body heat from the family of beavers. The dams, canals and lodges beaver builds have gained them the reputation as “Nature’s Engineers”. No other animal with the exception of man so significantly alters it’s habitat to suit it’s own needs and desires. Native Americans revered the beaver and referred to them as “Little People” for this reason. On land, the beaver’s short legs and wide body made them slow and vulnerable to their enemies. 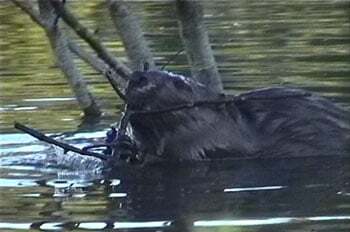 However, unlike most of their historic predators, beavers are excellent swimmers. As a result beavers evolved to have a strong preference to remain in or very close to the safety of the water. The need for safety is the primary reason beavers build dams to create ponds. 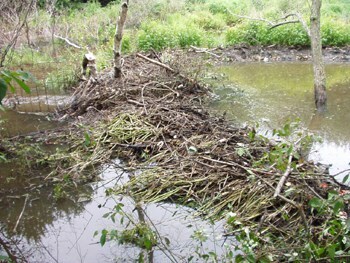 Beavers typically start building dams in low lying areas with shallow, moving water. They will utilize natural or manmade objects such as a rock outcropping or a manmade stone wall, a constriction in the streambed, a tree stump, etc. to anchor their dams. So while somewhat predictable, they can select from a wide variety of spots in which to build a dam. Once a pond is formed beavers do not have to travel far on land to gain access to new trees. The more area their dam floods, the more food they can safely access. Sometimes beavers will even excavate canals over a hundred feet long in order to bring water closer to stands of their favorite trees. This allows them to swim up close to the trees and retreat to the water quickly if they sense danger. In addition, they use the canal to float edible branches back to the pond. Beavers predictably select sites to build their dams based primarily on topography and food supply. 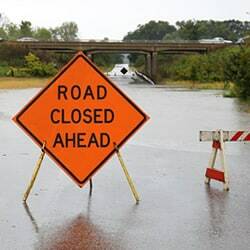 Preferred sites for damming will be in areas where the dam will flood a large flat area and there are plenty of desirable woody plants for food in the vicinity. Streams that are more than two feet deep or have strong currents are not generally dammed. Beavers often situate their dams where there are constrictions in the stream flow (natural or manmade). This is why beavers have a strong propensity to dam culverts. For relatively little work they can create a large dam and pond. 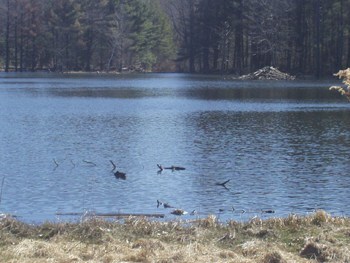 Each beaver colony will usually establish one large pond which where they will build their lodge. In addition to this primary pond other smaller dams up and downstream are usually built to create smaller ponds. These smaller ponds permit safe travel for the beaver as it seeks out new food supplies. The average beaver colony will dam a half-mile length of a small stream. Beavers are monogamous and mate for life. They do not breed until they are two to three years old. In Massachusetts the female becomes pregnant during the winter and gives birth in May or June..
Beavers have one litter of 1 – 6 kits per year. The availability of food appears to affect the size of the litter. Each established beaver “colony” consists of adult parents, and two years of offspring. Only the adult female breeds. The average number of beavers in an established family is typically six or seven beavers. We have seen as few as one and as many as thirteen. Once a beaver reaches the age of two they will usually leave the colony to find a mate and establish a colony of their own. This is the most very dangerous time in the life of a beaver. Not only can they be killed by predators or cars, other beavers will attack them if they enter their ponds. As beaver populations expand uninhabited watersheds can be difficult to locate since suitable beaver habitat only comprises 1 – 2% of the landscape. Beavers have been noted to travel ten or more miles searching for a place to live. Beavers have a highly organized social structure. Young beaver appear to play and wrestle with their siblings. This helps to develop their motor skills. They will groom each other using their hands and teeth. Young beaver have innate abilities to build dams and lodges, but improve these skills watching their parents or older siblings. Beavers are typically social and peaceful animals, with a strong family structure. However, to protect their limited food supply, a beaver will not allow unrelated beavers to inhabit its pond. To mark their territories they surround their ponds with scent mounds. Scent mounds are piles of mud with the adult’s castor oil mixed in. They act as warnings to any beaver that may be passing through the area. Adult beavers will defend their territory by attacking any beaver outside its family who enters it. However, other than territorial disputes or self-defense, they appear to have a strong inhibition towards biting and are not known to attack humans unless provoked.